Celebrating its eighth year, Keystone’s Winter Bluegrass Weekend brings acoustic roots and mountain culture to Warren Station, benefitting the Dercum Center. Warren Station will be rocking for two nights with an amazing lineup featuring some of Colorado’s most talented string bands. Friday night will feature local favorites Buffalo Commons, Timber!, and The Rail Splitters will headline the evening. Saturday the party continues with The Pine Beatles, White Water Ramble, and headliner Rapidgrass. If you are a fan of bluegrass or simply love live music, this is an event you won’t want to miss! On top of the great lineup, the Warren Station Bar will be serving drink specials all weekend. A portion of the ticket sales will be donated to the Dercum Center for the Arts and Humanities. Learn more about the beneficiary at www.dercumcenter.com. $25 each – Two Night Advance Ticket: *online only Best Value! Combination seated and standing room. General admission, first-come, first-served. Buffalo Commons is a collaboration of friends from Steamboat Springs, CO who enjoy fishing and floating rivers together as much as they do playing and writing songs together. The bond they share off stage comes across in the music, and is felt by everyone through the energy of their live performances. One can’t help but be captivated by singer/songwriter and guitarist Ty Woods’ soulful yet powerful voice. Band Members Eric Baker on mandolin, Randy Kelly on fiddle, and Denton Turner on upright bass provide a full body of sound to match the emotion and intensity of Ty’s vocals. Focused on writing original music with well thought out compositions and arrangements, the band works hard to stand out as a unique sound in acoustic music. Buffalo Commons’ songs will pull at your heartstrings in every way and may make you want to laugh, dance, cry, and rejoice all in one show. 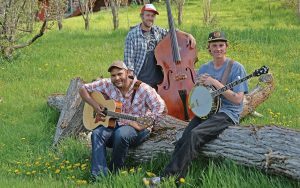 Timber!, a highly energetic bluegrass band from Boulder, CO, consists of Travis “Watermelon Hat Guy” on bass, Erik “Ginger McGee” Gustafson on guitar, Caitlin “Thanks, I like to play” Anderson on fiddle, and Chad “Sweet Hair” Martens on mandolin. Although rooted in traditional bluegrass and old time music, The Railsplitters are pushing the boundaries of those genres in every sense. With their lush harmonies, instrumental virtuosity and non-conformist songwriting, The Railsplitters deftly demonstrate what happens when musical influences ranging from samba to hip hop merge with traditional Appalachian music. Hailing from the Rocky Mountain front range in Boulder, CO, the Railsplitters spend their time on the road appealing to audiences all across the US and Europe. Their line-up features Lauren Stovall and her ‘Emmylou-esque’ vocals in the lead, Dusty Rider’s melodically intricate banjo licks, Peter Sharpe’s Brazilian and bluesy flare on mandolin, Joe D’Esposito’s New-England and Italian inspired fiddling and the ever-so-groovy Jean-Luc Davis on the double bass. The Railsplitters have won multiple awards including first place in the RockyGrass Band Competition in 2013. They’ve also successfully crowd-funded all three of their studio albums, including their latest, which is to be released later this year. To celebrate the fifth anniversary of the band, The Railsplitters will release the new album in late 2017 featuring 10 tracks of all new, genre bending, original music. 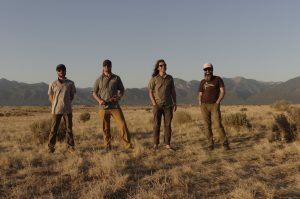 Described as “High-Octane Rocky Mountain DanceGrass”, Whitewater Ramble (WWR) uses a simple recipe to craft it’s sound: start with bluegrass instrumentation, add drums, and finish with a boundary-less approach to grassing-up everything from disco house grooves to roots to Americana. 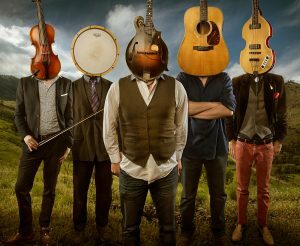 The Colorado-bred quintet combines the elements of mandolin, fiddle, acoustic guitar, upright bass, drums and vocals to explore the musical boundaries of multiple genres and to fuel their own mixture of original music and innovative cover song interpretations. 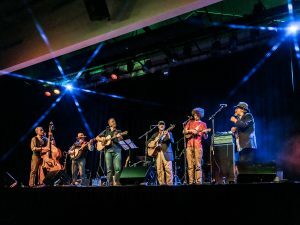 Whether playing an intimate encore, acoustic and unplugged in the crowd, or surfing on top of the upright bass, Whitewater Ramble delivers a powerful and memorable live performance. Currently on tour behind their second studio release Roots & Groove (produced by Tim Carbone of Railroad Earth), the band continues their growth as songwriters and musicians while earning legions of new fans and expanding their touring reach. The celebration of mountains and whitewater rapids is the inspiration for everything Rapidgrass. The Internationally acclaimed mountain music is influenced by an active, outdoor lifestyle. Brought together through music and love for mountains, they define modern, acoustic, Colorado mountain music. The lineup includes Mark Morris (guitar, lead vocals); Coleman Smith (violin); Carl Minorkey (upright bass); and Alex Johnstone (mandolin, vocals); Billy Cardine (dobro, recording producer). This front range Colorado ensemble uses classical, gypsy, bluegrass, pop, swing, and other world rhythms to create what is, and can only be described of as, Rapidgrass. 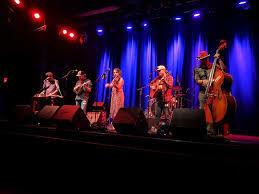 The band released ‘RAPIDGRASS QUINTET’, in 2013 and was voted as one ofthe top 5 albums by the Mountain Arts Culture Colorado. In 2015 they then released ‘CROOKED ROAD’ and went on to win the prestigious ROCKYGRASS band contest that same year. Rapidgrass produced their 3rd album, ‘HAPPY TRAILS’ in 2017 and was released at the eighth annual Rapidgrass Music Festival June 23-25 2017. The band is currently finishing their 4th studio album ‘GYPSY CATTLE DRIVE’ and 1st live album, both recorded in Chamonix, France August 2018. Rapidgrass has had the pleasure of playing mountain music throughout Colorado, Alaska, the lower 48, Ireland, Hungary, Scotland, Poland, and the European Alps. The band is eager to share new music with you!